Private clubs have been the foundation of the Championship through the years, but there are six public layouts that have made appearances in recent times, each open to the public, providing that you can afford the often considerable green fees. 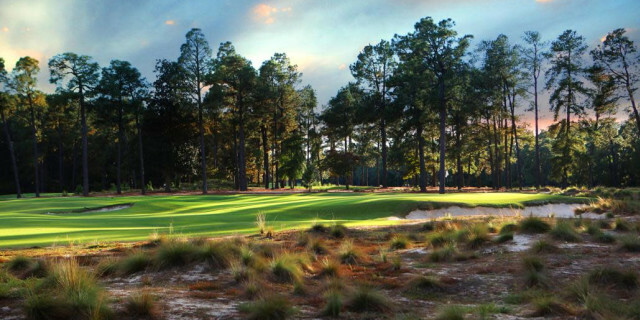 Host of the US Open in 1999, 2005 and 2014, North Carolina's Pinehurst No. 2 is the highlight of a spectacular public facility that features nine golf courses, several of them among the finest in the United States. However, No. 2 is the layout with the stature, and was originally designed by the great Donald Ross. The character of the holes was altered with them, but those origins were spectacularly restored by Bill Coore and Ben Crenshaw ahead of the double US and Women's US Opens that came to the venue four years ago, won by Martin Kaymer and Michelle Wie respectively. Regarded by many as the equivalent of St Andrews in the United States, packages are available to Pinehurst through Golfbreaks.com. The ultimate public golf course, Bethpage State Park has taken on legendary status for locals on Long Island, being the antithesis of the exclusive Shinnecock. There are five 18-hole courses on this site, but the testing Black is the most famous, hosting the US Open in 2002 and 2009. It will be home to the PGA Championship in 2019, and the Ryder Cup in 2024. Golfers famously pitch up overnight waiting for a tee time on the Black, though pre-booking is possible 48 hours in advance. Different rules and fees exist for New Yorkers and out-of-towners, but the fee to play is a more than generous $150 for those visitors from out of state. 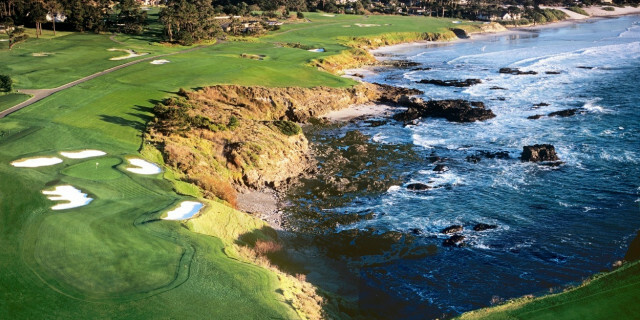 The iconic Pebble Beach Golf Links enjoys the most spectacular of locations on the Monterey Peninsula, and has hosted the US Open on five occasions, and will do so again in 2019 and 2027. Jack Nicklaus, Tom Watson, Tom Kite, Tiger Woods and Graeme McDowell all won here, and Pebble is annually showcased during the PGA Tour's AT&T Pro-Am. Several of the holes - the 7th, 8th and 18th among them - have become world renowned. Being a resort venue that is popular with stars of the screen and sport, Pebble is an expensive venue to play, but tremendous packages are available through Golfbreaks.com, combining this famous course with many of the other layouts that are nearby. 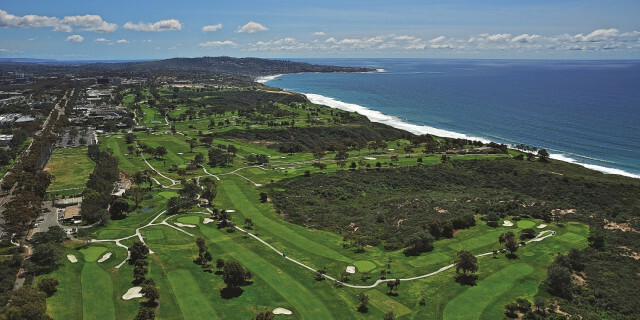 The two public courses at Torrey Pines have been a regular fixture on the PGA Tour since the 1960s, enjoying spectacular coastal views, but the arrival of the US Open in 2008 elevated the venue to another level. Tiger Woods has a long and rich history dating back to his junior days at Torrey, and his extraordinary victory at that US Open on the testing South Course in a playoff over Rocco Mediate has become the stuff of legend. 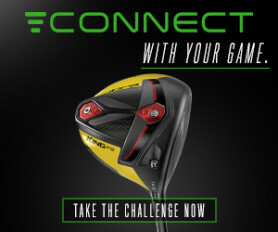 Non-residents can play for around $110, but travel packages are available to California on Golfbreaks.com. The USGA made a bold move in taking the Championship to this modern, links-style course in Washington State for the 2015 US Open, and it became a controversial week, as the setup of the layout was criticised by many. That said, it delivered a thrilling event as Jordan Spieth won following a dramatic finish, and visitors to Chambers Bay have reported the it's a wonderfully enjoyable course to play, albeit one that is yet to reach its peak of maturity. Whether the US Open returns to Chambers Bay is questionable, but it holds a unique place in history, and can be played by members of the public in the local area, but also by visitors for rates of $275. Packages are also available. The 2017 US Open venue was again something of an experiment, being a fresh addition to the rotation that was won by Brooks Koepka in a dominant performance. 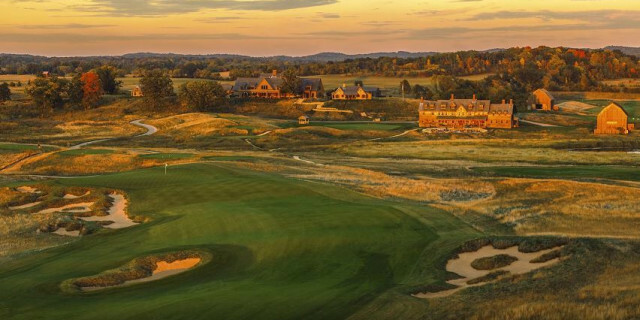 Opened for play in 2006, it's a huge property in Wisconsin, visually striking and green fees sit at $295, though other packages and booking options are available from the course directly.